Halloween can be a tricky time for oral health. Not only do children receive copious amounts of free candy, but they also tend to hold on to most of it long after the holiday is over. And it’s not just kids who enjoy a few too many sweets — adults can easily overindulge as well. It’s okay to enjoy a few treats this Halloween. By establishing a few basic rules ahead of time, you can help protect your family’s oral health. Avoid hard candy: Hard candy typically contains a lot of sugar, and it sits in your mouth for a long period of time compared to other candies. Plus, biting down on hard candies can potentially lead to a dental emergency such as a broken tooth. Sticky candies are another problematic sweet, as they tend to stay on teeth longer than other varieties. Don’t snack on sugary treats: It can be tempting to sneak pieces of candy from the bowl all day before trick-or-treaters arrive. However, it can be bad for your teeth to continually expose them to sugar. It is best if you can eat the candy with a meal, or shortly after, when your saliva production is high. 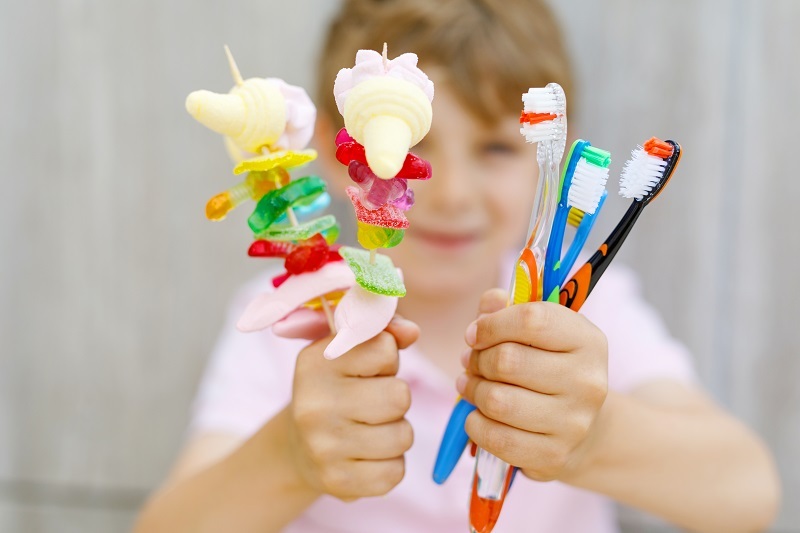 Brush, but not right away: It is important to brush your teeth after consuming sugar. However, you and your family should wait roughly 30 minutes before doing so. Brushing too soon after eating acidic foods or sweets can actually have an adverse effect on your enamel. Consider drinking water right away instead, as the water can help wash away some of the acids. Stick to a healthy routine: In the face of all this sugar consumption, it is more important than ever to stick to a good dental routine. This includes brushing twice a day, flossing once a day, and visiting our dentists for routine cleanings. Many of these tips can be useful even when the holiday is over. Excessive sugar consumption is always a potential cause for concern. While one day won’t make or break your family’s oral health, bad habits over the course of an entire year can cause complications. Healthy habits are a crucial part of protecting the function and appearance of your smile. If it's time for your routine visit, or if you have any questions or concerns that you would like to discuss with our experienced team, please call us at 303-790-2323. We proudly serve Lone Tree, Centennial, Highlands Ranch, and nearby areas of Colorado.